Cookie Conundrum: Macaroon or Macaron? 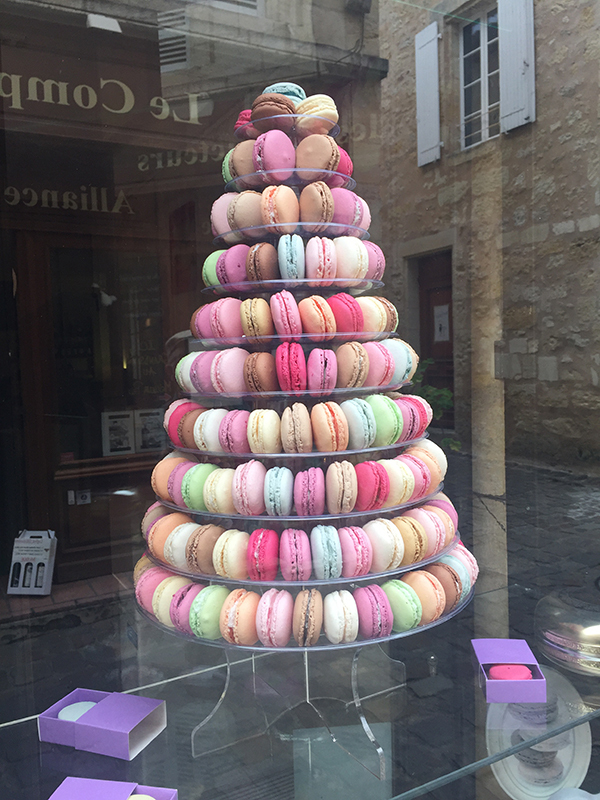 On my recent summer trip to France, I visited a few (or fifty) patisseries and enjoyed various heavenly desserts. Some pastries were already familiar to me, like chocolate eclairs, and I’d also previously met with Napoleons. Other creations, such as the fancifully named Tropezienne, were new to me, but we hit it off from the start. Also among the delights I recognized at French bakeries were the coconut macaroons remembered from my American childhood, as well as the many-hued meringue sandwich cookies known as macarons that have also become popular in the U.S. in recent years. Beyond that vague awareness, I caught myself wondering why macaroons and macarons share such similar names when they’re quite different to the taste and the eye. The chance for easily mistaken identity struck me. What if someone allocating precious calories got the cookie they didn’t like? Or just wanted to satisfy their palate’s particular craving for one, not the other? And could one even suffer serious scorn for referring to the wrong cookie? I, fueled with sweet energy, stopped to devote serious curiosity to these cookies’ origins. I found that others had already conducted careful research on this tasty topic, including author Paul Jurafsky. His 2011 Slate magazine article observed how colorful macarons had become popular in the US alongside the more familiar macaroon. Jurafsky wrote a similar essay excerpted from his book The Language of Food. Both articles describe how macaroons and macarons stem from a shared past dating back over a thousand years, one they actually share with macaroni! The story starts as early as the year 827, as culinary products were being shared across geographic regions. Sweet and savory foods like pasta and almonds intermingle through Jurafsky’s history. Jurafsky’s articles form a main course that deserve careful reads too lengthy for dessert. Suffice to say that macaroons weren’t always made from coconut. For several hundreds of years, they were commonly made of an almond paste. But before your coffee gets cold, flash forward to the comparatively recent 19thcentury. Near the end of Jurafsky’s post, he explains that in the U.S., coconut palms were introduced to Florida in the late 1800s, and coconut became a popular ingredient in desserts. In macaroons, ground coconut paste began to be used in place of almond paste. And because the macaroon cookie had no flour, it could be eaten by observant Jews during Passover. It’s the coconut macaroon that’s since become familiar in the U.S.
Around this same time, French macaroons, which weren’t limited to a coconut flavor, had often been sold in pairs. They evolved into a sandwich when Parisian bakers attached the cookie pairs with an almond paste, or ganache. Since the word “macaron” is the French word for macaroon, this French word has become commonly used in the English-speaking U.S. to distinguish the French-style meringue sandwich cookie from the American-style coconut macaroon. The range of macaron flavors is wide, often left to the imagination of the baker. Flavors can range from citrus, berry, nut, chocolate, and even floral tones like lavender. In contrast, the humble macaroon usually diverges only so far as to be dipped in chocolate. Perhaps you are having a coffee and want a sweet treat. If you see both macaroons and macarons in a bakery case, you’ll know you can either swoon over a macaroon or nibble a macaron to suit your taste in that moment. These similar-sounding cookies may be competing for your attention, so be sure you select the one you want. But before your coffee cools, know there is only yourself to stop you from having one of each in the interest of fairmindedness.